RECEIVE $$ OFF YOUR TUITION AND HELP US EARN!! We appreciate our families and are very happy to offer you this simple way to reduce your tuition. Just by doing your regular shopping with store cash cards, you will earn real $$ off your family's tuition! Using Cards while you shop is "tons of fun" and a great way to reduce your monthly tuition! Cards from national and local retailers are the same as money. Many popular retailers participate in this program; including Albertson's, Burger King, Chili's, K-Mart, Pizza Hut, Red Lobster and many, many more. The beauty of cash cards is that when you put your regular household shopping dollars to work, you receive actual $$ off your monthly tuition payments and help support our school at the same time! Just do your regular shopping with cash cards. Cash cards can be used for just about any household purchase including food, clothing, entertainment, gasoline and even dining out. Click here for a complete list of the retailers. 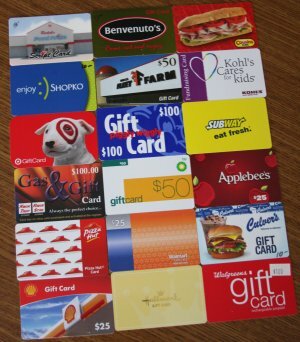 Indicate the number of gift cards you want to purchase on the order form. Be sure to circle the dollar amount (i.e. $25 card / $100 card). Fill out the remainder of the form and turn it into the school office with your check or cash by 9:00 AM WEDNESDAY MORNING of each week. (All orders must be prepaid). You will normally be able to pick up your order on Friday afternoon of the same week. You may pick up your order in the office, or request that it be sent home with your child. *Cards are normally received by the school office on Fridays. However, we cannot guarantee this, due to any unforeseen circumstances which may arise. Please plan accordingly! At the end of the month, you will receive a $5 certificate which you can redeem for your choice of gift cards if you have purchased a total of $500 for that month. Shop at your regular businesses with cards instead! Cash Cards are purchased on your behalf, and are not returnable. Please check your order when you receive it to verify its accuracy. If you find a discrepancy, notify the office immediately. for cards that are lost, stolen, or misplaced while in your or your child's possession. Don't forget to purchase them for giving at Christmas, birthdays, trips, etc. If you have any additional questions, please give us a call at 733-7820.